Today is Friday! And what's better than Friday? Food Friday! Yay! 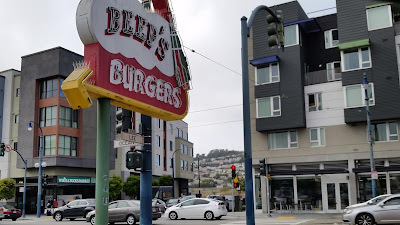 I had passed by Beep's Burgers many times while going to the nearby Whole Food Market, but I didn't eat there until I had lived in the area for several months. In general, I would attribute this to the establishment's appearance, a mix of classic and old, which was both enticing and unappealing. Fortunately, the day I decided to walk up and order a burger, I found the menu appealing and delightfully enjoyed the burger I ordered as well. Have any recommendations on burger places in your area? Want more of my thoughts and/or comments on Beep's Burgers? If you said yes to either, then head on over to food.supertran.net. *Prior to today's feature, I hadn't blogged any restaurant visits occurring between 20180508 and 20181005.